Two years after his bold decision to walk away from the NFL to make the Hajj pilgrimage to Mecca and travel the U.S. visiting masjids, Husain Abdullah has taken another step on the road back to the status he left behind. Earlier this week, Abdullah agreed to terms with the Kansas City Chiefs on a two-year contract after helping KC make a surprise playoff run last season. At the time Husain and his older brother Hamza — who played college ball together at Washington State — skipped the 2012 NFL season to fulfill an obligation they felt to Islam, Husain was a starting safety for the Minnesota Vikings and Hamza was a backup safety for the Arizona Cardinals. Since returning from their travels, Hamza, 30, has not been signed by an NFL team. 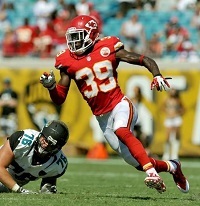 Husain, 28, was picked up for the 2013 season by the Chiefs on a one-year deal, sliding into a utility role as a backup safety, occasional cornerback and special-teams player. In KC’s wild-card playoff loss to the Indianapolis Colts, Husain intercepted QB Andrew Luck twice. By re-signing with the Chiefs, Husain seems back on track to becoming — if not a starter — a valued commodity in the league again. It should not go overlooked that the Abdullah brothers risked their careers by deciding to fulfill one of Islam’s five pillars when they did. Not because the NFL has any kind of anti-Muslim bias, but more because the NFL is an exclusive club with a lot of people on the outside clamoring to get in, and only a few people on the inside. If you’ve ever heard somebody say, “There are 100 people who would kill for that job,” that’s basically every job on an NFL roster. Once you step outside the club, you have to get back in line to get back in, and that line is sometimes impossibly long. Walking away from the league means you’re giving up your job to one of the many men capable of taking it, and if you come back a year later, teams may have already forgotten about you and moved on. Especially for a player like Husain, who has a history of concussions. Personally, I don’t think Husain and Hamza simply being Muslim prevented them from being signed last season. After all, the brothers were open and vocal about their faith back when I covered them at Washington State, and that didn’t stop them from reaching the NFL in the first place. But it’s possible that the pilgrimage and one-year sabbatical from the game made some teams question the brothers’ full commitment to football. Which is understandable. And at the same time, Muslims should prioritize serving and submitting to Allah above any occupation anyway, even if that occupation pays millions of dollars. There are a few teams around the NFL for which Husain could probably be a starter, but the Chiefs have a good thing going after finishing last season 11-5 and challenging the aging Denver Broncos for the AFC West title. Playing for Kansas City, Husain is learning from Hall of Fame cornerback Emmitt Thomas, the team’s defensive backs coach, and assistant secondary coach Al Harris, a former player whom Deion Sanders has called one of the best cornerbacks he’s seen. Plus, Kendrick Lewis, KC’s starting safety opposite Pro Bowler Eric Berry, is currently a free agent. “It’s still a wait and see because of who we bring in, what happens in the draft and how things shape up with OTAs, minicamps and training camp as well but I would imagine that I would have an expanded role,” Abdullah was quoted by the Chiefs blog Arrowhead Pride about his future with the team. Is Muhammad Ali the next Muhammad Ali?